A cardiologist does not normally lecture on bacteria, stool, or the intestinal barrier. But I traveled to Philadelphia to lecture to a medical audience on the growing overlap of GI health and cardiovascular health. One example is the metabolite TMAO which is produced in part in the intestinal wall and liver and impacts cardiovascular health. Another example of the Gut-Heart nexus that is perhaps of even greater importance is the topic of metabolic endotoxemia or ME for short. A brief dive into this body of science will identify that ME may be the most important pathway leading to chronic diseases such as atherosclerosis, diabetes, obesity, dementia and cancer. That is saying a lot. An endotoxin is an immune compound also called lipopolysaccharide (LPS). LPS can cause inflammation and is a component of what’s known as gram-negative bacteria. Roughly 65–75% of the bacteria within the gut are gram-negative bacteria. Bacteria use LPS as an “adhesion molecule” to stick to and colonize the gut. The structure of LPS can be important to determine its potential toxicity. 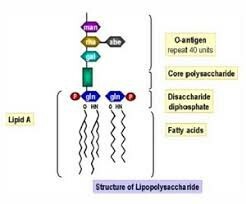 LPS has a tail called the lipid A structure is the fatty acid portion of the LPS. 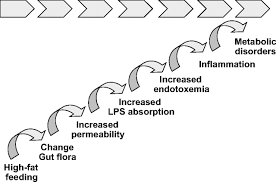 The toxicity of the LPS is mainly determined by the types of lipid A components that it has. Some lipid A components are more toxic than others. Healthy individuals will have a low level of circulating LPS. 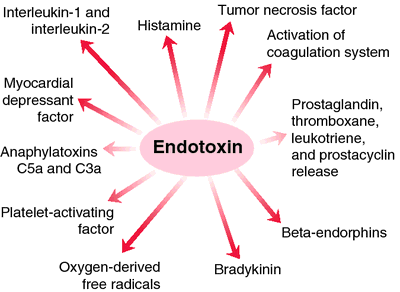 Endotoxemia simply means high levels of endotoxins, or LPS, in the blood. In metabolic endotoxemia, a person’s microbiome in the gut fails to protect the body from absorbing toxins during the digestion of a meal or snack. Studies of different populations across the globe consistently show that people in Western societies have microbiomes that provide weaker protection against metabolic endotoxemia. What is metabolic endotoxemia (ME)? Endotoxemia starts with a high-fat diet, or even a single high-fat meal. Digestion of high-fat meals can create a chain of events that both create endotoxins and allow them to permeate the gut barrier. First, the digestion of a lot of fat can cause gut dysbiosis — an imbalance of gut bacteria — which causes the opening of the tight junctions in the gut that should create a barrier. A high-fat diet results in a large die-off of gram-negative bacteria, leading the dead bacteria to release LPS from their cell walls. In this instance, the gut-body barrier is open and toxic LPS molecules — endotoxins — are floating around the lumen in the digestive tract and enter the circulation. LPS shows up in the body’s circulation shortly after a meal, thus causing metabolic endotoxemia or postprandial endotoxemia. Once circulating in the body, LPS interacts with fat cells and other immune cells and creates chronic, long-term inflammation in virtually every tissue in the body. Unfortunately, the body takes a long time to recover from this. What kind of fats cause ME? Saturated fat drives metabolic endotoxemia the most of all fats. In fact, coconut oil is one of the most toxic versions of fats in terms of endotoxemia and has been studied in humans. The long-chain fatty acids in coconut oil — the lauric acid, for example — are extremely endotoxic. Comparing different fats to a saline solution as a control shows both coconut oil and animal fat produce a higher endotoxin response compared to other types of fat. Cod and fish oil produce less of an endotoxin response than animal fat, and omega-3 fatty acids dampen the metabolic endotoxemia response. Vegetables oils are somewhat neutral compared to saline, though not if they are oxidized, which will produce a very high endotoxin response. How do we know it is the fat content, particularly saturated fat content, of the Western diet and not the excess sugar? In a randomized study in humans, cream raised the level of serum endotoxin but a glass of orange juice rich in sugar did not. In fact, orange juice can blunt the rise in endotoxin that is released from a high fat, high refined carbohydrate meal. 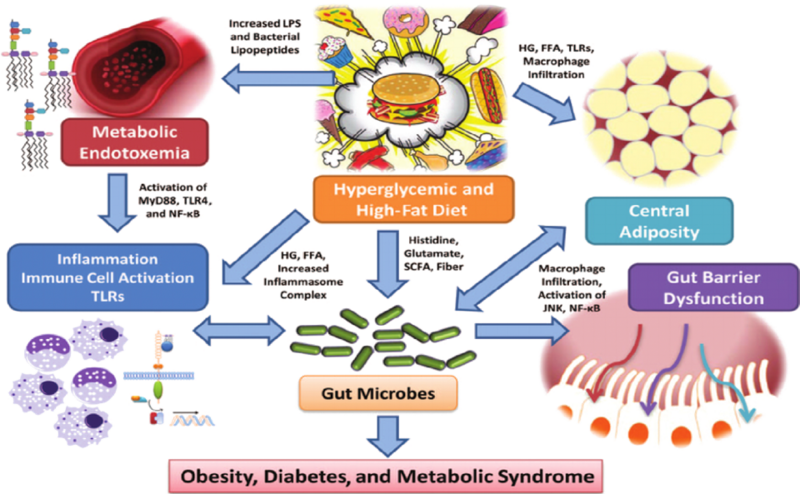 Weight and metabolic diseases have a close link to endotoxemia. People who are obese, who have been overeating, or who are type 2 diabetic tend to have much worse endotoxic response than people without these conditions. This begs the question, does someone experience higher levels of endotoxemia because they are diabetic or obese, or does pre-existing endotoxemia contribute to obesity and diabetes? Several preliminary studies on the topic shows metabolic endotoxemia may induce obesity and diabetes. Amongst non- communicable diseases, bacterial toxin translocation and intestinal permeability — leaky gut — is a leading cause of disability, mortality, and workplace absence worldwide. Metabolic endotoxemia has also been shown to lead to low testosterone levels and obesity in men, which reduces quality of life and increases risk of depression and heart disease. Scientists at the University of North Texas ran a pilot study with a spore based probiotic rich in Bacillus subtilis in humans. They measured metabolic endotoxemia in healthy subjects before and after a high-fat meal. After the month of probiotics, the participants showed a reduced endotoxic response. After the pilot study, the team of researchers expanded the experiment to a larger, double-blind placebo study, published in the World Journal of Gastrointestinal Pathophysiology. Thirty days into the study, the group that received probiotic supplements saw a 45% reduction in endotoxins compared to their baseline following a challenge meal, while the placebo group saw a 28% increase in endotoxin levels. This preliminary result prompted the researchers to extend the experiment to 90 days. Other blood markers showed a benefit from the probiotic treatment. After 30 days of probiotics, volunteers’ serum triglyceride levels dropped by almost 50 points, whereas triglyceride levels the placebo group remained the same triglyceride levels are a hallmark of ME. The rise in ME from high fat meals, particulary rich in coconut oil, can be addressed by changes in dietary choices. Avoiding high fat meals rich in saturated fats has been recommended as a strategy to avoid and resolve ME. These approaches has been reviewed in detail. A recent preliminary study found that pomegranates may offer some unique ability to lower ME. While not specifically studied in terms of endotoxin release, a whole food, plant diet naturally low in saturated fat would be an appealing route to avoid ME and may explain the lower risk of heart disease and diabetes. In a prospective study, a diet enriched with plant fiber, polyphenols and plant proteins was found to reduce ME and to induce favorable changes in the microbiome. At the present time it is not routine to measure blood endotoxin or LPS levels. Inflammatory markers like the hs-CRP should be measured and reflect the amount of ME. The impact of dietary, lifestyle and supplement measures can be followed by a reduction in the hs-CRP.